The Administrative Council (AC) of the International Amateur Radio Union held its annual meeting on October 1-2 in Salinitas, El Salvador. The AC is responsible for the policy and management of the IARU and consists of the three IARU international officers and two representatives from each of the three IARU regional organizations. The IARU Region 2 General Assembly -- held October 4-8 -- also in Salinitas, immediately follows the AC meeting. Read more here. This summer, the ARRL offered two advanced ARRL Teachers Institutes on Wireless Technology (TI-2) sessions. One session focused on how to integrate space into the classroom, while the other concentrated on basic and more advanced electronics concepts and ham radio operations. "As we gain experience as to what content is need to help teachers to better integrate basic electronics, the science of radio, microcontrollers and robotics into their curriculum, the TI program continues to be refined and expanded," said ARRL Education and Technology Program Coordinator Mark Spencer, WA8SME. "The TI-2 program is an offshoot of that effort and provides a 'graduate level' opportunity for graduates of the regular Teachers Institute sessions." Read more here. 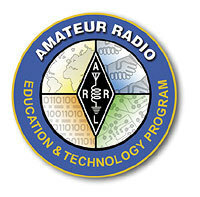 In May 2010, the ARRL Executive Committee reviewed grant applications for the ARRL's Education & Technology Program, awarding nearly $6400 to seven schools. More than 475 schools across the country have received support from the ETP in the form of grants for equipment, curriculum and resources, as well as teacher in-service training through the Teachers Institute on Wireless Technology. The Executive Committee reviews applications for equipment and resource grants twice each year, in December and May. Read more here. The ARRL has sponsored two Homebrew Challenges in the past, designed to test our members' design and construction skills by making useful amateur gear at low cost -- and sharing their results with our members. Our first ARRL Homebrew Challenge, announced in QST for August 2006, required the construction of a 40 meter, 5 W voice and CW transceiver built for less than $50 of new parts. The Second Homebrew Challenge, announced in February 2009, resulted in a number of creative designs of low cost 50 W linear amplifiers to follow the transceiver -- two for about $30, as well as a multiband amplifier with many features for somewhat more. 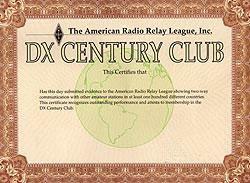 A single band 25 W SSB and CW transceiver for 10 or 6 meters (Option 1), with a prize of $200. A 25 W SSB and CW transceiver that can be switched between 10 and 6 meters, using one or two switches (Option 2), with a prize of $300. Read more here. This feature is a concise monthly update of some of the things ARRL is doing on behalf of its members. This installment -- which covers the month of September -- includes seeking protection of amateur frequencies with the FCC, representing the ARRL at the local, regional and national level, training Field Organization leaders, administering ARRL awards programs and more. Read more here. Not since after World War II -- with new European entities -- and the break-up of the French colonies in Africa in the early 1960s, have so many new possible DXCC entities come into existence all at once. No, it's not a colorized re-release of a 1960s B-grade beach movie. On Sunday, October 10, five islands in the Caribbean are all changing their governmental status at the same time: Saba, St Eustatius, Bonaire, St Maarten and Curacao. Known collectively as the Netherlands Antilles, these islands have up to now been an autonomous part of the Kingdom of the Netherlands. Some will remain within the Netherlands as "special municipalities" and some will become independent nations within the Kingdom of the Netherlands, just as the island nation of Aruba did back in 1986. What this means for the HF bands is a lot of interference as the new DXCC entities are born: Two DXCC entities (the island pair of Bonaire & Curacao and the three-island group of St Maarten, Saba and St Eustatius) will be deleted from the DXCC list of active entities and be replaced by up to five new entities! Read more here. 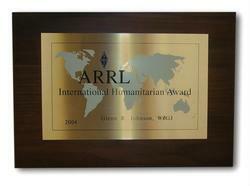 Nominations are open for the 2010 ARRL International Humanitarian Award. The award is conferred upon an amateur or amateurs who demonstrate devotion to human welfare, peace and international understanding through Amateur Radio. The League established the annual prize to recognize Amateur Radio operators who have used ham radio to provide extraordinary service to others in times of crisis or disaster. Read more here. This colorful QSL card commemorated a previous NWR Week operation. Amateur Radio operators will be on the air in observance of the 2010 National Wildlife Refuge Week, scheduled for October 9-17. This event will coincide with festivals and special events at refuges that help connect people with nature at the country's more than 500 National Wildlife Refuges. 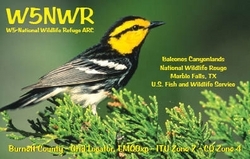 Combining Amateur Radio's communication capabilities with enjoyment of the outdoors to help others learn about the National Wildlife Refuge System (NWRS) is the goal of the amateur stations participating in the nine-day event. Hams begin operating from a number of wildlife refuges this week under guidelines established in cooperation with the US Fish and Wildlife Service (USFWS). Only those stations that have authorized, responsible access to refuges are sanctioned by this event. For the first time, the US Senate has passed a resolution officially recognizing National Wildlife Refuge Week. The resolution "recognizes the importance of national wildlife refuges to wildlife conservation and the protection of imperiled species and ecosystems" and "reaffirms the support of the Senate for wildlife conservation and the National Wildlife Refuge System." Visit the National Wildlife Refuge Week Ham Radio Web site for more information and a list of participating ham radio stations. 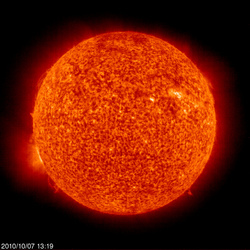 The Sun, as seen on Thursday, October 7, 2010 from NASA's SOHO Extreme Ultraviolet Imaging Telescope. This image was taken at 304 Angstrom; the bright material is at 60,000 to 80,000 Kelvin. Tad "Here comes the Sun King; everybody's laughing, everbody's happy" Cook, K7RA, reports: Solar activity quieted over the past week. There were no sunspots on Wednesday, October 6, and the average daily sunspot number declined nearly 18 points to 27.6, compared to the previous week. The average daily solar flux values were off more than 3 points to 81. The predicted solar flux for the next 10 days -- October 7-16 -- is 75, 76, 78, 78, 80, 79, 80, 80, 82 and 81. Looking at the STEREO image early Thursday morning shows an active region in our Sun's southern hemisphere, just over the eastern horizon. Perhaps this will bring more sunspots. Look for more information -- including an updated solar forecast and reports on 15 meter activity -- on the ARRL Web site on Friday, October 8. For more information concerning radio propagation, visit the ARRL Technical Information Service Propagation page. This week's "Tad Cookism" is brought to you by John Lennon's Here comes the Sun King. Visit the News Tips page on the ARRL Web site to submit a news story to our Editorial team. Your Amateur Radio-related news tip could end up in QST, online or in The ARRL Letter. Include contact information: If the person sending the tip isn't the main point of contact, be sure to include that person's contact information. Photos: When a story has a photo or two included, attach it to an e-mail message addressed to news@arrl.org and include caption information, as well as the name and call sign of the photographer. With a little work, the Hamtronics R303-137 weather satellite receiver board offers a great way to receive fascinating weather satellite images. Read a review about this product, as well as the ICOM IC-R6 portable wideband receiver and Wouxun's KG-UV2D and KG-UVD1P dual-band handheld transceivers in the November issue of QST. Click here to watch the video.